How did the public respond to the Reading Room in the 2008 Turner Prize exhibition? This report suggests ways in which the purpose and design of the room should be reconsidered in the future. A reading room has been a regular feature of the annual Turner Prize exhibition but its role has not been evaluated to date. This report aimed to shed light on the interpretative activity undertaken here, analysing the level of engagement between the visitors and the various interpretative devices on offer. It also aimed to obtain data about the use, and misuse, of the comments board. write a comment and pin the comment card to a notice board. The evaluation was carried out for eight weeks from 16 October to 5 December, every Thursday and Friday, in two one-hour time slots. Two methods of data collection were employed during this evaluation: observation and analysis. For the first, every third visitor to enter the Reading Room was observed and notes about their behaviour were made. In total 170 visitors were observed. The second method of data collection was to analyse the comment cards that visitors left on the notice boards. These cards were removed on a daily basis throughout the Turner Prize exhibition to clear the walls of offensive material and to create space for more comment cards. The removed comment cards were sorted by subject and counted to establish what themes were most popular. Observations showed that 60 per cent of visitors were female and 40 per cent were aged between 16 and 34. This was very much in line with the Ipsos MORI findings made at the same time for the exhibition, which showed that 62 per cent of visitors were women and 44 per cent were aged between 16 and 34. However, it can be said that the visitor profile of the 2008 Turner Prize mirrored that of the general visitor profile to Tate Britain in that year in which 60 per cent of visitors to Tate Britain were female and 36 per cent were aged between 16 and 34. Almost 60 per cent of visitors spent less than two minutes in the Reading Room. This statistic emphasises the critical importance of making an instant impact on visitors on their arrival into the Reading Room if it is hoped to increase public use of it. One third of visitors engaged with no devices in the Reading Room. The explanation for this might be that the value of the room’s interpretative devices was not made clear enough to these visitors, or that, for whatever reason, they were keen to leave as soon as possible. Half of visitors engaged with one or two devices and 15 per cent engaged with three devices. Less than 5 per cent of visitors interacted with four or five devices. The most popular activity was reading the comment cards, which attracted almost 50 per cent of visitors. Almost one quarter of visitors took a badge, one fifth watched the artists’ films, 15 per cent wrote comments, a further 15 per cent read wall panels and 10 per cent read books. The popularity of the interpretative devices varied according to age groups. The most popular activities for visitors aged under 35 were reading the comment cards, taking a badge and writing comments. By contrast, the most popular activities for those aged over 35 were reading the comment cards, watching films or doing nothing. 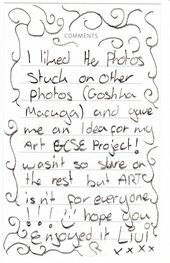 Only twenty-six visitors out of the 170 observed visitors to the Turner Prize 2008 exhibition wrote comments. Surprisingly, the twenty-six visitors wrote forty-one comments, averaging 1.5 comments each. Most comments were written by 16–34 year-olds, while the 60+ age group wrote the least number of comments. Two thirds of those who wrote comments did so in less than two minutes, while the remaining one third completed their comment cards in three to five minutes. As recorded by the observers, almost 50 per cent of the comments left on the notice boards were negative, almost 30 per cent were positive and 15 per cent were neutral (see figs.1–3). Over 50 per cent of the comments discussed the Turner Prize, while almost 20 per cent were irrelevant and 10 per cent mentioned art in general terms. As the second method of testing public use of the Reading Room, 14,075 comment cards were removed, sorted and analysed in the eight-week period of the evaluation. 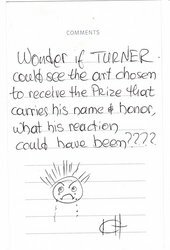 The analysis made from this process showed that 55 per cent (7,791) made comments that were relevant to the Turner Prize, by which it is meant that they discussed the Turner Prize, art, artists or Tate. 45 per cent (6,284) discussed matters irrelevant to these topics. These statistics are significantly different from those obtained from the observations which indicated that 79 per cent of the comment cards discussed relevant themes and only 17 per cent discussed irrelevant subjects. The analysis of removed comment cards is certainly more reliable, however, as it used a sample of 14,075 while the sample of comment cards in observations was only forty-one. The report indicates that visitors of different ages chose to interact with different interpretative devices, supporting the argument for a broad provision of interpretative devices. Activities in the Reading Room that were popular among visitors under 35 had less appeal for those aged over 35 and vice versa. The only activity that was consistently least popular across all age groups was reading books. This is perhaps a reflection on the choice of books or a wider indication of people’s reluctance to sit and read books in a public space. Future Reading Rooms would benefit from more consideration of whether to include books at all, and if so how to maximise their use. Another interpretative device that was consistently unpopular across all age groups was reading wall panels. This might be explained by the location of the panels behind the chairs used for watching artist videos, or the colour of the text (light grey on white), making the panels unobtrusive and easily ignored. In future, the wall panel texts would benefit from being placed in a more prominent position, and would need to be presented in darker type to ensure that visitors can read them easily and at a distance. The most popular activity across all age groups was reading the comment cards, though what visitors gained by reading the comments of others has yet to be evaluated. The reading of comment cards led to many discussions in the Reading Room between visitors about the exhibition they had seen with the comments acting as starting points and springboards for these discussions. In effect, the comment cards were used by visitors to interpret the works on display and to share these interpretations with the exhibition-going public. On entering the Reading Room many visitors were immediately attracted to the notice boards. The visual impact of the boards was a factor in their popularity and they need to remain as eye-catching as possible in the future to retain their appeal. The sheer quantity of irrelevant comment cards (45 per cent) needs to be addressed in future years. Irrelevant topics included messages about the love lives of the visitors as well as more topical current affairs such as the American presidential election. A way of reducing this might be to place questions on or around the comments boards to stimulate the visitors to think about the Turner Prize or debates within art while framing their comments. A significant number of visitors appeared to want to write a comment but were unsure what to write. Questions might steer these undecided people into leaving a relevant, rather than irrelevant, comment. Another approach might be to change the word ‘comment’, which can seem general in nature, to something more exhibition-focused such as ‘response’. 1. Ipsos MORI used the categories under 25, 25–44, 45–59 and 60+ until 2008, when they changed the categories to 16–34, 35–44, 45–59, 60+. This text is a summary of a longer report commissioned by the Head of Learning, Tate Britain. Ashlee Honeybourne was an intern in the Learning department at Tate Britain. Ashlee Honeybourne, ‘Turner Prize 2008 Reading Room Report’, in Tate Papers, no.11, Spring 2009, https://www.tate.org.uk/research/publications/tate-papers/11/turner-prize-2008-reading-room-report, accessed 24 April 2019.